It’s been a long two weeks. We’re deep into the semester now: we’re tired and harried but we’ve still a long way to go. I even took the step of giving out a pop quiz last week to check if they’re reading the stories. Judging from the results almost all of them are. So it’s not that they’re slacking. It’s more that they still don’t seem sure how to do it, how to read a text. Admittedly, it’s not easy. One thing I’ve noticed these past two weeks, however, is that the class has started to stratify: there are those who are really starting to get it, and there are those who aren’t. Usually that separation happens sooner in the semester. I don’t know what it says about this group, or about my teaching of them, that they’ve either stayed together this long or that it’s taken some this long to pull away. Since it was the first day after Fall Break, I started by reminding students of some of the things we’d learned about narrative voice. We had studied Lawrence’s use of third person narration in “The Last Straw,” noting how he privileged first one character’s point of view and then another’s, and sometimes a point of view attached to no character at all. This served his interest in conflict between individuals. We had studied Pearlman’s use of first person in “Binocular Vision,” noting how this technique limited our perspective so that we knew only what the narrator knew (which, we learned, was quite different from what her parents knew). First person narration gave us intimacy with the character but consigned us to her blind spots. Only with difficulty could we read “against” her. Bibi Haldar is a woman, no longer so young, who lives near Calcutta at an unspecified time—I place it in the 70s or 80s but the story doesn’t tell us for sure. She suffers from a mysterious illness that sounds like epilepsy but that has resisted every attempt at a cure. Bibi lives on sufferance with her cousin and his wife in an apartment above their small cosmetics shop, but she is most often found in the storage room on the roof of the building, where she records inventory for the shopkeeper. The narrators are an unspecified group of neighbourhood women, who have known Bibi since she was a child. Unlike her, however, they are married with children. Everyone seems to want this for her too. An exasperated doctor, finding nothing wrong with Bibi, dismisses her with a classic chauvinist prescription: “a marriage would cure her.” “The Treatment of Bibi Haldar” is an odd story in that not much happens for a long time, and then a lot happens quickly right near the end. For most of the story, Bibi bemoans her fate, suffers debilitating spells of illness, is consoled or advised, more or less, by the narrators. I say more or less because already in that early claim that she “spoke louder than necessary” we see that the narrators might be ambivalent about Bibi. When the cousin’s wife gets pregnant, she becomes convinced that Bibi is bad luck, eventually banishing her to the rooftop. The narrators respond with indignation and take their “only revenge”: they boycott the cousin’s store. This tactic is successful enough that before long the cousin and his wife and child move away, leaving only an envelope with 300 rupees. In this manner she raised the boy and ran a business in the storage room, and we did what we could to help. For years afterward, we wondered who in our town had disgraced her. 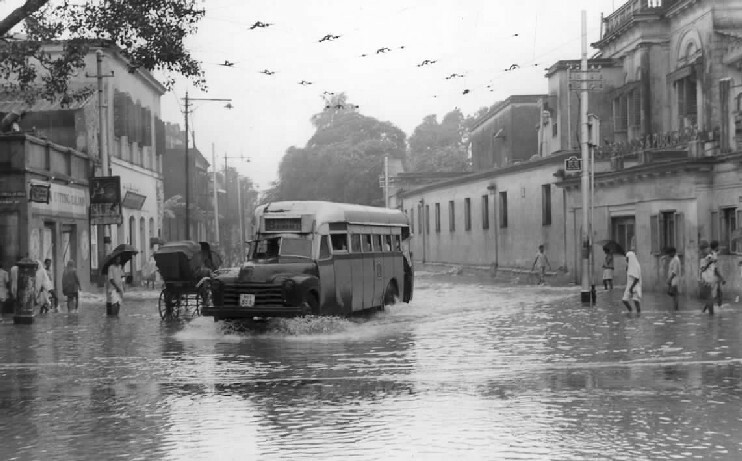 A few of our servants were questioned, and in tea stalls and bus stands, possible suspects were debated and dismissed. But there was no point carrying out an investigation. She was, to the best of our knowledge, cured. I began by asking the class to write for a few minutes about the first-person plural narrator. What is the effect of this choice? How does it ask us to read the story? They had to reference at least one passage from the story in their writing. I gave them five minutes or so to work on this—some time I’ll write an essay about what it feels like in those peaceful but also rather guilt-inducing moments (I always feel like I should be doing something) when I’m wandering the aisles, looking out the window, watching them turn pages and scribble furiously and stare blankly—before making them exchange their writing with a partner. They discussed their writing for a few minutes, an exercise that brought a lot of energy into the room. Hoping to sustain the vibe I decided not to take up the specific questions I’d asked: sometimes students have a hard time returning to a group discussion after talking in small groups, even though they usually have lots to say to each other there, it’s as if they feel they’d said all they had to say already to their partner. Instead I asked something much more general: What is Bibi like? The first answers—tellingly: this story is all about how women look—were about her appearance. The narrators flatly say she isn’t pretty, and even their ostensibly neutral descriptions feel unpleasantly judgmental: “her shins were hairless, and sprayed with a generous number of pallid freckles.” (“Sprayed” and “pallid” undo the work done by “generous.”) Then came other answers: she’s not like everyone else, she’s not part of the group, she’s an outsider. But she wants to be part of the group, someone piped up. She’s conventional, I said, summarizing tendentiously. How do you know? I pursued. The student replied by pointing to this passage: “Like the rest of us, she wanted to serve suppers, and scold servants, and set aside money in her almari to have her eyebrows threaded every three weeks at the Chinese beauty parlor.” (The students could even tell me what an almari is—Hindi for a free-standing wardrobe—which given my earlier struggles in this regard I regarded as a victory.) Notice, though, that the narrators are the ones providing this information. They judge her to be “like the rest of us.” (Incidentally, that phrasing suggests the narrators might themselves want this—that is, they might not have attained the life they think they ought to have.) We are back in Pearlman territory, I said, where people see only what they want to see, only what confirms their world-view: Bibi must want to be like us. What’s wrong with her? I asked. Why does she need to be treated? No one knows, the students said. She’s sick, they said. She’s tried all kinds of cures and been to all kinds of doctors. Nothing works. Then, something more interesting: she doesn’t know how to be like everyone else. The narrators try to teach her, though: they “began to coach her in wifely ways,” preparing her for a suitor that never comes, not least after her cousin, having been pestered by Bibi and the narrators, puts her on the marriage market, even arranging to have her photo taken, ready to be circulated in the homes of eligible men, a process that culminates in a terse advertisement in the town newspaper designed to repel rather than attract: “GIRL, UNSTABLE, HEIGHT 152 CENTIMETERS, SEEKS HUSBAND.” We didn’t linger over this ad as much as we might have: had we considered the cataloguing function of its absurd specificity about her height we might have been able to connect this moment to a lengthy passage later in the text, which we only came to late in the class period and couldn’t do justice to, a wonderful and enigmatic and disturbing description of Bibi’s late father, a math teacher, who, we learn, had “kept assiduous track of Bibi’s illness in hopes of determining some logic to her condition,” but who is able to find out nothing more than the number of attacks and that they were more likely to happen in summer than in winter: meager conclusions considering his near-constant monitoring. In this he is rather like the narrators, who watch her all the time, it seems, but don’t know her very well. Needless to say, the ad gets Bibi nowhere, but what I wanted the students to see was the way the story was showing us, here as elsewhere in the story, how being a woman in the world of this story (as, of course, in our own) is learned rather than natural. Bibi’s “unnatural” qualities are not outliers to a norm, but rather evidence of that norm, of behaviour that all women in the story must undergo. In this way, every woman in the story is unnatural. If Bibi really is the exception that proves a patriarchal rule, then you might be able to guess where I was going with my next question, Do the narrators like Bibi? This proved to be a good question: easy enough for students to access, but not that easy once we got talking about it. Some students said yes, pointing out how the narrators cared for Bibi when her relatives didn’t, how they took her under their wing, how they worked with her apparently unprepossessing material to shape her into a form some man might find acceptable. Most pertinently, they pointed to the scene of solidarity where the women run the cousin out of town by boycotting his business. These students seized on the text’s use of the word “revenge” to support their belief that the narrators care for Bibi—assuming, of course, that it is Bibi, and not themselves, their status as women, that they are avenging. The question of whether the narrators like Bibi is best answered by looking at the end of the story. When her cousin exiles her to the rooftop to keep her away from his child, Bibi tries to reassure the narrators: “‘The world begins at the bottom of the stairs. Now I am free to discover life as I please.’” We’re led to believe—because the narrators do—that this is plaintive, unconvincing bravado. For as soon as she says it, Bibi shuts herself off from the world. All the more shocking, then, to the narrators and to us when Bibi gets pregnant. What they say when they discover the state of things is quite revealing. She said she could not remember what had happened. She would not tell us who had done it. We prepared her semolina with hot milk and raisins; still she would not reveal the man’s identity. In vain we searched for traces of the assault, some sign of the intrusion, but the room was swept and in order. On the floor beside the cot, her inventory ledger, open to a fresh page, contained a list of names. The first two sentences are presented as near synonyms. But they’re not the same. How are they different? I asked. One is about what she couldn’t do, and the other about what she wouldn’t. What difference does that difference make? The first is about inability, the second about refusal. In both cases, the narrators assume Bibi has been raped, and of course that is a strong, depressing possibility. Yet we mustn’t overlook how much the narrators want that to be the case. They can’t imagine any other possibility: the only suggestion that there might be another way to read the situation lies in how strongly they refuse to countenance that possibility. They simply can’t imagine that a man might have wanted Bibi, and that she might have wanted him. So intent are they on confirming their lurid speculation that they even try to bribe her, preparing her a dish presumably intended to soothe her morning sickness—but “still she would not reveal the man’s identity” (my emphasis). They want assault, intrusion, violation, but they search for it in vain; they find only cleanliness and order. The ledger, “open to a new page,” offers an image of a fresh start, a new kind of inventory to replace the cosmetics that were so unsatisfying to Bibi. The doctor, it turns out, was wrong. Bibi didn’t need a man; she just needed some sperm. Or, she did need a man, but a son rather than a lover or husband. The narrators pass over Bibi’s newfound success rather hastily in the story’s final paragraph, preferring to harp on what they admit they will never find: the identity of the man they insist has disgraced her. But in the final sentences they admit defeat: “But there was no point carrying out an investigation. She was, to the best of our knowledge, cured.” The qualifying clause inserted into the last sentence holds out the possibility—the hope, even—that they might be wrong. Not to mention the conviction that something was wrong with Bibi. But to be right, in the world of this story, at least for women like our narrators, is to be reduced to a sameness, to live through the expectations and desires of others. An interesting thing about this story is that there are almost no men in it. It’s a sign of how insidiously patriarchy works that women can do their own policing. We see, then, I said in the last minute of class, that the story’s title must be read in two ways. 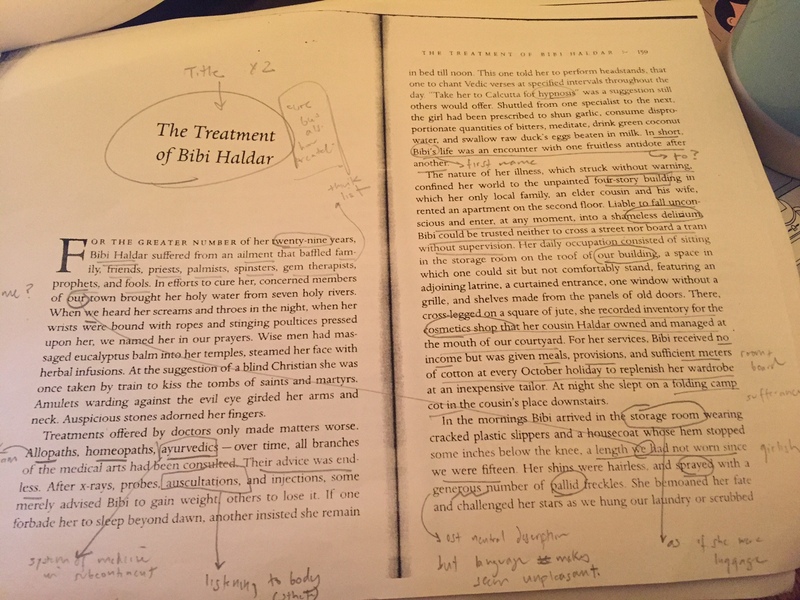 The treatment of Bibi Haldar refers to the various medical and cultural and psychological treatments she undergoes, especially, ironically, the “treatment” of becoming pregnant, having a child, and becoming a person for whom there are no other models in this story, and therefore a person decidedly at odds with the “we” who narrates it. But the treatment of Bibi Haldar is also the attitude or disposition of those narrators to Bibi. And the way they treat her is ultimately not very pleasant. It seems, however, that by refusing to be “like the rest of us,” Bibi finds a surprising escape from that treatment. This wasn’t a story I knew well before I taught it. I’d read it once, years ago, and then skimmed it when I put it on the syllabus. Re-reading it the night before class I was sure I had nothing to say about it. But it proved more surprising than I’d credited. In the end I don’t love this story, it doesn’t have a hold on me the way many of the course texts do. And the reading I came to with the students is perhaps not the most sophisticated. But it worked for them, it hit a kind of interpretive sweet spot: they were left understanding the story in a new way, but that way wasn’t so difficult or abstruse that they couldn’t find a point of entry into it. Sometimes, on good days, a class period ends with a tangible feeling of appreciation and accomplishment. That’s what happened on that Monday, and not even the let down of the Wednesday that followed can take that feeling away. This entry was tagged bibi haldar, calcutta, jeffrey eugenides, jhumpa lahiri. Bookmark the permalink.